Roland drum sound module TD-30 from japan AC100V F/S. This product is a JDM product (Japanese Domestic Market). Voltage:100V Plug :Type A. External dimensions / mass Width (W) 330 mm Depth (D) 258 mm Height (H) 106 mm. Sometime SAL or Epacket takes a long time. About other area, please ask me. The reason why that happens is a post officer in your country does not update the info when the item get your country. If the item gets lost, I will turn a paper in a post office to research where the item is. I asked post office to improve the system, but please keep that in your mind. So, do not worry about it. Thank you for your understanding. (It might be more than a month). 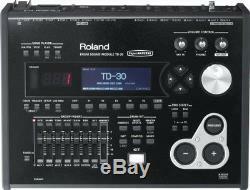 The item "Roland drum sound module TD-30 from japan AC100V F/S" is in sale since Wednesday, January 17, 2018. This item is in the category "Musical Instruments & Gear\Percussion\Drums\Electronic Drums". The seller is "yosh-set" and is located in KYOTO. This item can be shipped worldwide.